If every chef has a signature dish, this one has to be mine. This dish has a mind of its own – and I mean it. I have never got it tasting the same twice, ever. Just adjusting the amount of dal-tomatoes-lemon-pepper-cumin-water, simply put – any ingredient in this dish – is all it takes to give the dish a different color/taste/texture every time you make it and also makes it easy enough to cater to every palette out there. And that is precisely why I am going to find it very difficult to provide an exact measure in this recipe – my suggestion: make it so it is just RIGHT for you – that’s what I do! Mash the pressure cooked mixture, taking care not to fully mash the tomatoes. 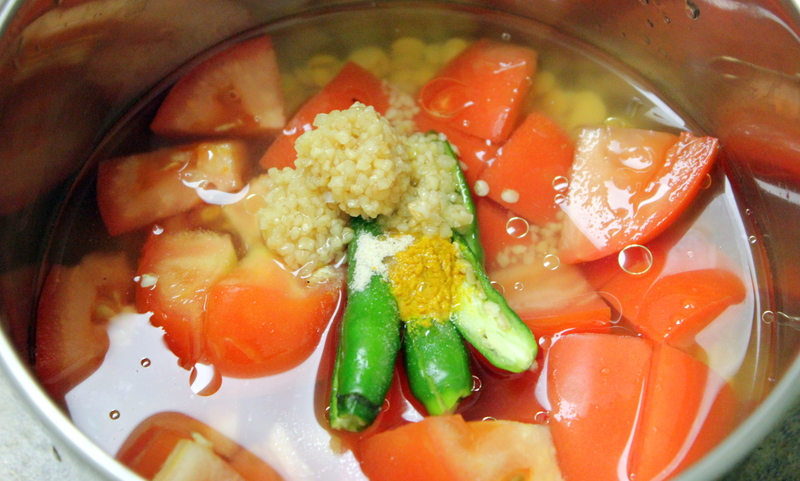 Add water to bring rasam to desired consistency. Add rasam powder and salt – check taste to make sure everything is as desired or adjust at this point if needed. Heat some oil in a pan, add mustard seeds and curry leaves and let it crackle. 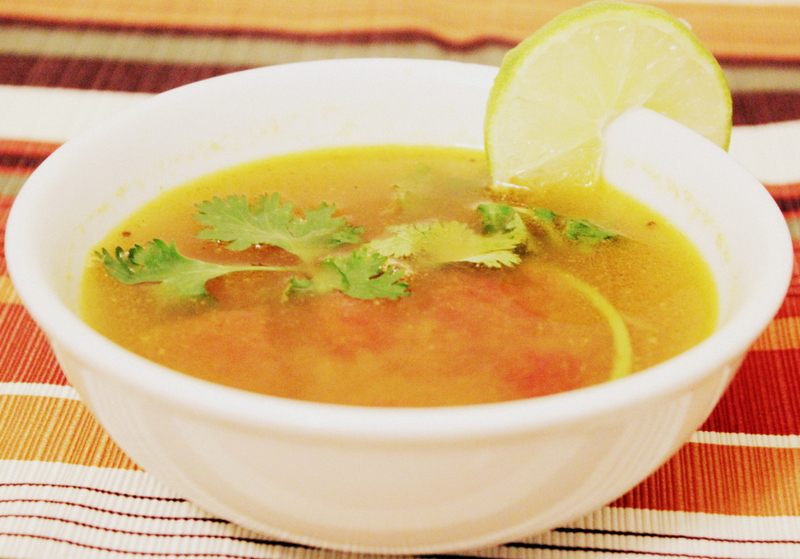 Pour in the rasam mixture and cook on med-high until the rasam comes to a boil – turn off the heat right away. Add the lemon juice and coriander leaves. Serve as a soup or with rice and get ready to go home! If you already have pre-cooked dal or some left over from another dish, you could skip pressure cooking the ingredients in step#1 and instead simply prepare the rasam concoction with the mashed dal and the other ingredients listed in step #1 and step #4 and directly add to the pan after the tempering and let it cook right there. You could substitute toor dal with yellow moong dal, either partially or wholly, for a lighter version of the rasam. Make sure you add the lemon juice after turning off the heat, as otherwise it tends to impart a bitter flavor to the rasam. Quickie version: If you are in a hurry, you could even skip the tempering all together and completely finish up the dish in the pressure cooker – after pressure cooking the ingredients, add the water, rasam powder and salt and bring to a boil and turn off and add lemon juice in the end – that’s it!